Our Facebook page will keep you up-to-date on status of our photo contest, new sculpture installations and other Outdoor Sculpture events. Click on Facebook icon to take you to our Facebook page! The Robin Larsen Gallery at New Hope Arts hosts the first PNC Arts Alive Outdoor Sculpture Design Competition from January 23 to 31. The Exhibition which coincides with the Lambertville –New Hope Winter Festival offers more than 35 new concepts for outdoor installations and provides an opportunity for viewers to vote on their favorite works. Selected works will be installed in the Spring of 2016 as a part of The PNC Arts Alive Outdoor Sculpture Project, a free and accessible public art display creating an artistic gateway into the Borough of New Hope, PA.
New Hope Arts invites the community to view the sculpture design exhibition and participate in the selection of new works. Presently, the Outdoor Sculpture Project consists of 12 sculptures. Two locations along PA Route 32 near the 202 Bridge are now on the art map. New sculptures placed in Solebury Township are expanding the celebrated outdoor exhibition administered by New Hope Arts, a recipient of a sponsorship grant provided by the PNC Foundation and is Arts Alive Program. The PNC Arts Alive Outdoor Sculpture Project, inaugurated on the July 4th weekend, is a free, accessible and on-going outdoor exhibition creating an artistic gateway to the Borough of New Hope. Joining the ten existing sculptures are Gantry, a large rustic steel construction hosted by Solebury Parks and Recreation at Magill’s Hill Park, and Common House, a carved marble figure displayed on the lawn of St. Philip’s Episcopal Church. The two neighboring works by nationally known sculptors are being celebrated on September 19, at the Solebury Day festivities. This is the 1st Annual Solebury Day, a community wide event celebrating community pride, promoting Township programs at Laurel Park from 10 am to 4 pm. Last week Gantry, by Susan Griswold, was reconstructed in a four hour process which included moving the components by crane, leveling the base, and welding the steel structure securely. Susan Griswold’s work is widely exhibited in sculpture parks throughout is United States and she is currently the founding director of St. Johns Sculpture Park in Portland Oregon. A collaboration about the placement of the Gantry included Dudley Rice, Director of Solebury Township Parks & Recreation, New Hope Arts director, Carol Cruickshanks, publicist, Marilyn Bullock and sculpture experts Harry and Wendy Gordon preceding a presentation to the Solebury Board of Supervisors. With the Board’s approval the process of de-installing the work from its previous placement in the Pratt Institute of Art Sculpture Park in Brooklyn brought this significant work to our area began. PNC Arts Alive Outdoor Sculpture Project now expanded from New Hope to Solebury is in keeping with the mission of the project to collaborate and revitalize the arts in our community. Solebury’s Board of Supervisor coincidentally was considering outdoor sculpture as a part of their development of the park and Gantry is placed by the side of the Solebury Township Trail, for the enjoyment of walkers and Sculpture Map followers. Nearby on the property of St. Philip’s Episcopal Church is a smaller marble sculpture placed on a pedestal base. Father Michael Ruk and Gene Underwood were actively interested in the Outdoor Project and asked for a placement early in the summer. New Hope Arts coordinated the selection of Common House, by Lauren Ewing. Lauren has exhibited her work nationally and internationally in galleries and in museum installations. This work was previously exhibited in MuSA Pietrasante, Tuscany Italy in 2014 in conjunction with a marble sculpture program at William Patterson University. Get the new Sculpture Map including 12 artworks displayed throughout New Hope and Solebury. For more information about the PNC Arts Alive Outdoor Sculpture Project go to the website www.sculptureproject.org. The map can be downloaded to smart phone by a QR code on the plaques at each sculpture. 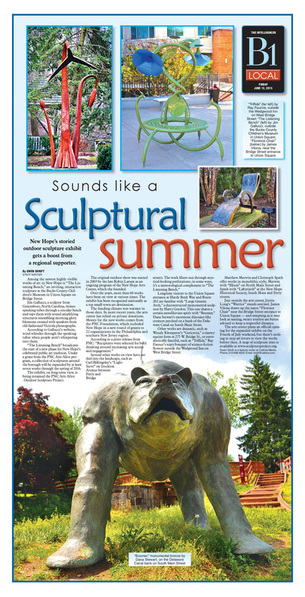 RIGHT: July 2, 2015 Bucks County Herald article on PNC Arts Alive Outdoor Sculpture Project, 4th of July weekend celebration and Outdoor Sculpture Photo Contest. 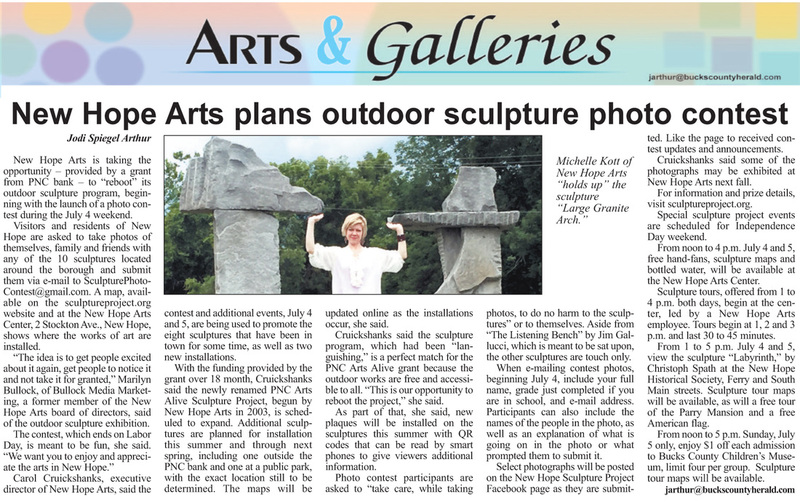 LEFT: Intelligencer & Bucks County Courier Times full- page article on PNC Arts Alive Outdoor Sculpture Project, Friday, June 12, 2015. BELOW: Bucks County Herald press release on PNC Arts Alive Outdoor Sculpture Project, Thursday, June 11, 2015.